Add a cluster to centrally manage installs and configurations within Lifecycle Manager for DataStax Enterprise clusters. By default, all datacenters within a cluster inherit the configuration profile from the cluster level, unless overridden when creating the datacenter model. By default, all nodes within a datacenter inherit the configuration profile from the datacenter level, unless overridden when creating the node models. SSH settings can also be inherited or overridden at the datacenter or node levels. Repositories are only specified at the cluster level and are inherited by datacenters and nodes. Click Clusters from the Lifecycle Manager navigation menu. If you do not have any clusters yet, click the adding a cluster link on the Getting Started page. Click the + (plus) sign above the Clusters pane. The Add Cluster dialog appears. Required: Enter a name for the cluster. The name reflects the cluster name in both DataStax Enterprise and Lifecycle Manager. The cluster name cannot be edited after clicking Save because LCM populates the cluster_name field in cassandra.yaml with the entered value. Optional: Specify a SSH Management Port to override the default of 22. Select a predefined Config Profile to apply at the cluster level. If config profiles are not defined for datacenter or node levels, those levels inherit from the cluster. Select a predefined Repository from which to access DataStax Enterprise install packages. Datacenters and nodes inherit the repository from the cluster level. Defining a repository for the datacenter or node level is not necessary. The newly defined cluster displays in the Clusters pane. 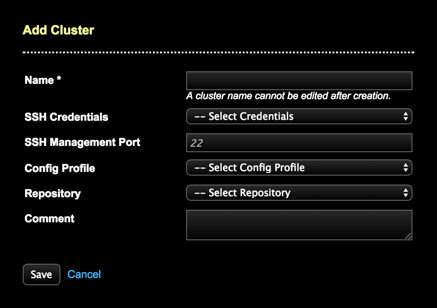 Click the cluster title to view its details. The Datacenters pane becomes visible.